Life Insurance Corporation (LIC), Established in 1956 is one of India’s oldest, reliable, prominent and a trusted insurance company. LIC has been providing insurance to millions of Indians. Currently, LIC has expanded its products and to cater to the insurance and financial needs of its customers. LIC offers numerous methods through which customers can pay for their policies. Payments for LIC policies can be done online on the LIC website, at authorised banks, franchises, approved LIC agents and Paytm. 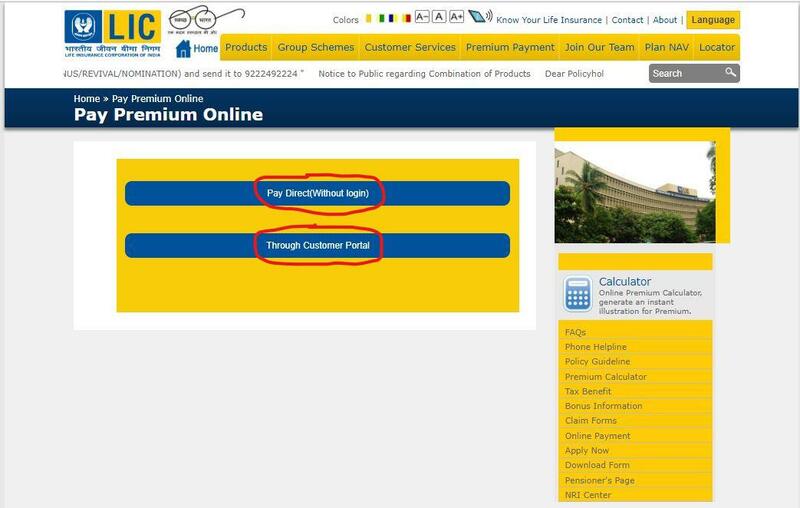 The option to make premium payments online is now possible by LIC, this makes payments efficient and secure for customers. The payment process for registered and non-registered users are different but nevertheless customers will benefit from the same efficiency and security of making payments anywhere and anytime. Registered policyholders can choose to pay their policy premium via the e-Services facility offered on the LIC website. Step 1 – Visit LIC India website. Select from the two option “Pay direct” or “Through customer portal”. Step 2 – The following options will ask you to provide details and credentials of your LIC policy. The LIC login ID and password will be required if you select the customer portal option. Provide the necessary information and click on the Submit button. Step 3 – Once clicked, you will be asked to provide your policy number and the premium amount payable. Step 4 – After you have entered the details, you will be able to view all of your enrolled policies. Step 5 – After viewing your policy details on the portal, you will be able to see an option “Pay Premium online” to enable you to make the payment online. Step 6 – From this page, select the respective policies for which you want to pay the premium for and click the Submit option to confirm your selection. Step 7 – You will be redirected to the payment gateway page where you can select to make the prefered payment option either net banking or credit/debit card. The National Payments Corporation of India (NPCI) has implemented a service comprising of an electronic payment gateway known as National Automated Clearing House (NACH). NACH will soon replace the existing ECS created by the RBI. 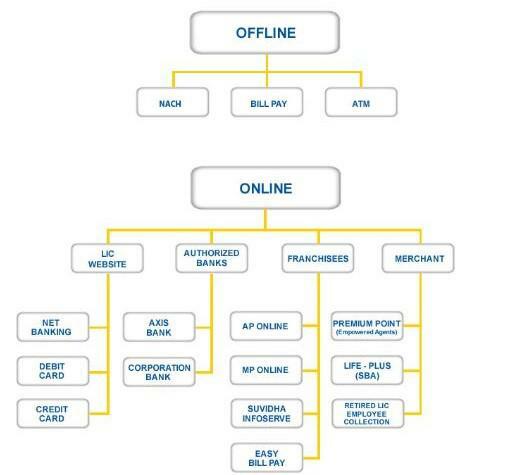 Under the NACH system, mandate forms are to be submitted to the respective branch of LIC for premium payment. This facility is absolutely free for all customers. The customer has to register his policies through the respective bank website. LIC has partnered with two of India’s leading banks (Axis & Corporation) to provide an added convenience to all their customers in making premium payments for LIC policies. LIC customers can make their policy premium payments at Axis Bank or Corporation Bank branches as well. Collection of premium by authorized personnel will be done for insurance, ULIP policies but not for health insurance. There is no service charge or fee levied for usage of service through authorised personnel. 1. After logging into LIC payments website, click the circle against ‘IDBI Gateway’, Identify your card type (debit/credit) and enter the amount of premium you have to pay to find out the tax and other charges applicable with your payable amount. click, Submit after completing the process. 2. You will be now be redirected to the page where you will be asked to enter the details of your card i.e. the debit/credit card number, card’s date of expiry, CVV2/CVC2 number, your name as on the card, email ID and mobile number. You will also have to enter the “captcha code” displayed in the box. Finally, you will be asked to enter a one time password (OTP) or ATM pin to complete the payment in full. 3. Click on Pay, you will receive a receipt regarding the payment made on your email id that you have registered with your LIC policy. There is no delay in time from the instance of payment to obtaining receipts. A secured method, as the data of your policy is not shared between LIC, the banks or any third party over the internet as only the amount to be paid is data encrypted and transported through a safe medium. The login id at both the sites (LIC and Bank) is known only to you. All of the above processes are free of charge for you to avail. 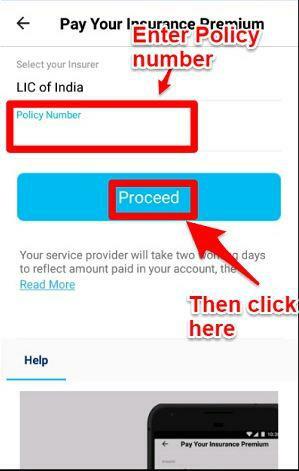 LIC policy premium can be paid with Paytm either by Paytm app (android & apple) or Paytm website. Once you open Paytm app or website, you will see various bill payment options to choose from. 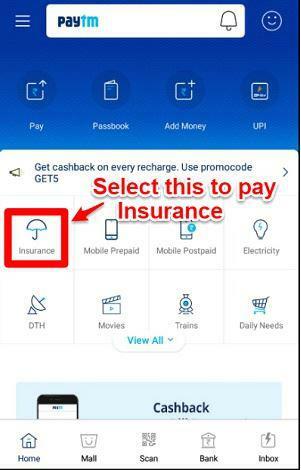 Select the Insurance icon and then select LIC from the option. Refer screenshot above. Following this, you need to enter your respective LIC policy number and proceed to make the payment using Paytm wallet or pay through Paytm using other options such as credit card, debit card or internet banking. After successfully paying LIC policy, you will receive a confirmation message via Paytm notification, SMS and email showing a successful payment message. With the exception of some plans, In case you have not paid LIC premium within the scheduled due date, LIC grants you a relaxation time frame to make payments without the payment of interest on the premium. This particular time period is called the grace period. The grace period for policies having a monthly mode of payment premium is 15 days from the due date. The grace period for policies where the premium payment mode is quarterly, half-yearly or even yearly is one month from the due date. If you are considering a new policy or renewing one, LIC offers a great tool known as an Online Premium Calculator. This calculator helps you to generate an instant quotation for Premium that you require. The first page of the policy bond highlights the months in which premiums are due. By cash, local cheque (subject to realization of the cheque), Demand Draft at Branch Office. Demand Draft, cheques or Money Order be sent by post. Standing instructions from your respective bank to remit the premiums. Premium payment can also be made through ATMs of Corporation Bank and UTI Bank. Status of your policy indicates if your policy is active or has lapsed due to non-payment of premium or policy has crossed expiry. Policy status also provides other important information with respect to your policy, which you can utilise for your reference. The status of your policy is available at the branch that served your policies. If your policy has lapsed due to non-payment of premiums or other criteria within the due date, the terms and conditions of that policy are void, until you revive your policy. To revive a lapsed policy, a payment of the accumulated premium along with interest as well health requirements of the concerned individual as required. Most LIC plans are endowment in nature and will be eligible to stand as a collateral to raise a loan against your require funds. You can either repay the loan with interest or continue paying the interest and allow the loan to be deducted at the time of the claim payments.